Did you know that 800 Million People in the World Can’t Read? IFEMME Opened Doors to Raise 100 000 EUR to change that. A fine art photography project IFEMME created by a Vietnamese photographer Viet Ha Tran and a Ukrainian white shirts brand Simplifi inaugurated its first exhibition in alma mater of its founders IE at Maria Molina 31/Velasquez on 16 November 2017. 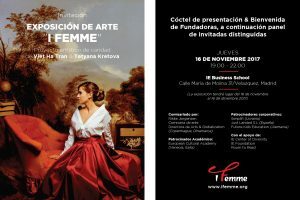 The exhibition will run in Madrid through December 16, 2017 presenting 20 pieces of fine art photography picturing educated women of different backgrounds in their national clothes and white shirts. Through the symbolic white shirts IFEMME showcases modern, independent, liberal and successful women of the 21st century, who are the owners of their destiny while still maintaining their cultural identity. “As a child, I dreamed of changing the world, in one way or another with this project I hope to be part of making changes happen. I believe that education is the most powerful tool, which can be used to make change happen and art is another powerful instrument that helps changing a person’s inner world and vision.” – says Viet Ha Tran, the fine art photographer and co-foundfer of IFEMME. The limited edition art photographs will be available to collectors through galleries, auction houses and a series of events that will be held in key capitals of the world including London, Paris, New York, Moscow, Mumbai, Tokyo, Shanghai, Singapore, Hong Kong, Dubai and Capetown within the next two years. Together with a specially developed model of white shirt and silver IF-shaped cufflinks art photographs will be sold at online platforms www.ifemme.org and www.simplifishirts.com. All generated profit will be donated to educate girls in Asia and Africa via Room to Read Girls’ Literacy Foundation. “White shirt brand Simplifi was born two years ago to become the first customer of the newly launched social enterprise in Ukraine funded by the UN structure. Producing our shirts there is our way to create jobs for women deprived at the labor market. IFEMME is our next step of changing the world by brining women to help women” – shares Tetyana Kretova, co-founder of Simplifi and IFEMME. IFEMME art exhibition is curated by Rikke Jorgensen (Denmark) and is supported by the growing network of people and companies, among which an institutional partner IE Foundation and IE Center for Diversity, corporate sponsors Just Landed S.L, Future Kids Education (Germany) and an academic partner European Cultural Academy (Italy). Together with IE Center for Diversity IFEMME will replicate the event globally. With the aim of generating 100 000 EUR within the next few years IFEMME is inviting smaller donations through purchasing an art photography post card at 5 EUR or donating as much as 1 EUR directly at its Room to Read donation page https://give.roomtoread.org/team/130124. Viet Ha is a Vietnam-born and Spain-based fine art photographer known for her emotionally dense and endlessly compelling photographs of women. Her art emphasizes fantasy and imagination as a source of aesthetic experience. Her work has appeared in El Economista, Vogue Italia, Vanity Fair France, The Times of India, Vietnam News, Vietnam Television, at Saatchi Gallery London, and has been auctioned by Christie’s Hong Kong for charity. 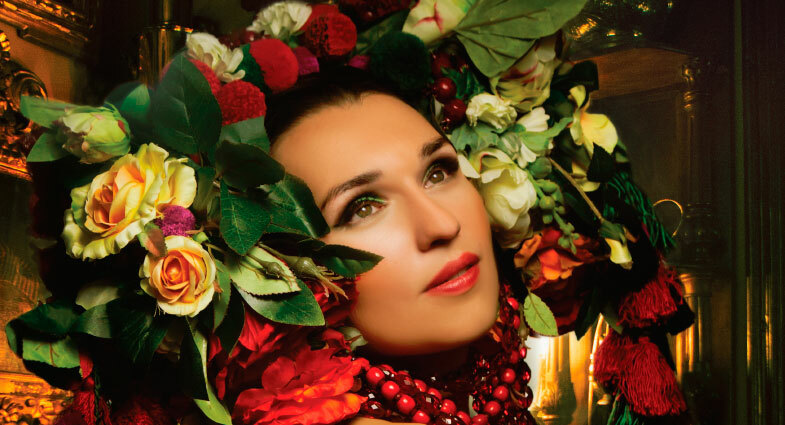 She is listed as global artist by Artprice, the world leader in art market information, and has been represented by Art+Commerce/Vogue Italia, the largest global photo agency based in New York. Starting photography in 2013 as an enthusiastic hobbyist photographer until the present, Viet Ha’s artwork has been published in over 120 different magazines and newspapers around the world. Her artwork is collected by galleries, auction houses, luxury hotels, art dealers and more around the world. Born Ukrainian, Tetyana is an international business professional based in Spain. Throughout her tenure she has always held an active social position of creating positive impact on the lives of people, founding a national organization for young leaders, JCI, which supports NGOs dealing with issues related to increasing economic opportunities. Her most recent venture Simplifi, where she serves as Creative Director and Co-Founder, is a socially committed white shirt company for women. The brand does not only aim at providing high quality products but also encourages women to be true to themselves. Successful CEOs and top managers are among brand clients, since the brand aims at people who set positive examples for success. The shirts are created and produced in Ukraine at the social enterprise Barvysta which employs women in need. We envision a world in which all children can pursue a quality education that enables them to reach their full potential and contribute to their communities and the world. Room to Read seeks to transform the lives of millions of children in low-income countries by focusing on literacy and gender equality in education. Working in collaboration with local communities, partner organizations and governments, we develop literacy skills and a habit of reading among primary school children, and support girls to complete secondary school with the relevant life skills to succeed in school and beyond. Room to Read invests in nearly one million children each year and aims to invest in the lives of at least 15 million children by 2020. The IE Foundation is an instrument of IE that enables students, teachers and administrative personnel to further their educational, research and management activities. Priority is given to the training of and cultural outreach institutes and members that have ties with IE. Resources go to funding scholarships for students, grants for training and research for professors, and funds for updating and improving IE’s educational structure. The Foundation operates throughout Spain, and also has an international presence throughout North and South America, Southeast Asia, the Middle East, Northern Africa and Europe. The IE Foundation is supported by the donations of both private individuals and companies. Thanks to their support IE’s training, research and management activities continue to grow. The Center for Diversity in Global Management at IE was created in September 2002. The Center’s mission is to promote diversity management of gender, culture, personality and age as a competitive advantage in the corporate world, through reflection, creation of knowledge and the dissemination of know-how. The Center’s main aims are: To foster a greater understanding of the demand for and needs of corporate diversity, by analyzing the improvement in bottom line results and effectiveness of inclusion policies. To improve diversity in the corporate world by promoting training programmes in management in minority groups both in western companies and developing countries, thus promoting the integration of women into the economic fabric. To generate debate and the exchange of experiences in the field of diversity. Laura Rodríguez Arias is currently assistant to the Director at the IE Center for Diversity. She is also journalist and video editor. She has developed her professional career in several news media. Interested in social and international issues, she has studied and worked in France and Uruguay. She works coordinating the Center’s activities, and also develops its community management. Pia Montemayor : Young. Female. Local.